Monsoons have arrived early this year and that too in a deluge, throwing life out of gear in north India. Uttarakhand was the worst hit, with incessant rains followed by landslides and floods killing 10 people, according to officials, and washing away homes. Media reports put the death toll between 30 and 50. The state saw heavy rains of 220 mm on Sunday, causing rivers to swell well above the danger mark. According to the India Meteorological Department (IMD), heavy downpours are expected to continue in the state for another 48 hours. The Met department said the rains will become lighter from June 18 when the state will be out of the alert region. The whole country, except for Haryana, West Bengal and North-Eastern states, have received above average rainfall. Over the weekend, 28 per cent surplus rainfall for the country increased to 68 per cent, according to data released by the Met department. Out of 36 meteorological subdivisions, 27 have recorded excess rainfall and four have recorded normal. Haryana and West Bengal had deficient rain, while Arunachal Pradesh, Assam, Meghalaya, Nagaland, Manipur, Mizoram and Tripura have had scanty rains so far. "Monsoon has hit the entire nation early by one month. It is by July 15 that all parts of India receive rains. This year that day came as early as June 15," said Shailesh Nayak, secretary, Ministry of Earth Sciences. He said multiplicity of conditions have together created such a situation. "This year several things synchronised to lead to early monsoons," he said. 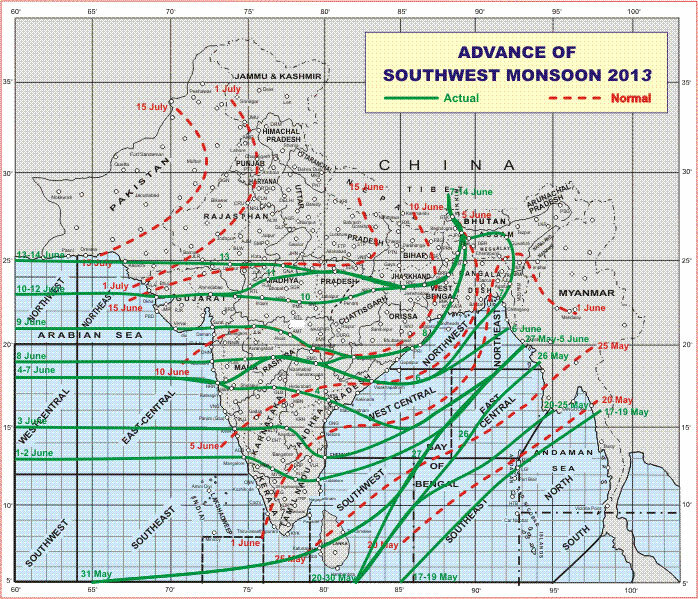 In the initial phase, called the onset phase, monsoon hit Andaman and Kerala following the normal time and trend. "However, after that the combination of lower pressure in north-western region and movement of three types of winds led to monsoons hitting other parts of the country way before their normal time," said an official in the Met department. Usually, monsoon sets in by June 1, while this time it arrived in the last week of May. It moved fast towards the north, without taking its characteristic break before hitting one region after the other. Unprecedented quantity of water released from upstream Hathinikund barrage; will the consequent flood be worse than the one in 1978? Low pressure over east Rajasthan attracted south-westerly winds from the Arabian sea, laden with moisture. At the same time, easterly winds from Bay of Bengal came along the foothills of Himalayas. The westerlies also crossed Uttar Pradesh and Bihar, creating a trough. The mountains of the north created orographic effect (it occurs when an air mass approaches a mountain range and is rapidly forced upward, causing any moisture to cool and fall as rains). The officials said that once the monsoon has set in, it will continue for the entire season, which normally ends in late September. L S Rathore, director general of IMD, said that predictions for the rest of the season shows there will be average rainfall this year. "We have already had excess rainfall for June. July will witness 101 per cent rainfall while the figure for August is 96 per cent," he said. Average rainfall for the whole country for the whole season is 89 cm. Out of this June's share is 16, July's 29, August's 26 and September's 17. While the country has already receive 10 cm rains in June, which is 48 per cent surplus till now, July will see the country receiving 30 cm rainfall, and August, 25 cm. The prediction for September is yet to be made. Uttarakhand was put on high alert following the heavy rains during the weekend. The river Ganga at Haridwar is flowing at 1.5 metre and the Yamuna at Hathnikund is flowing at 0.75 metre over the danger mark, said Prem Singh Pawar, executive engineer, irrigation department of Uttarakhand. The Mandakini and Alaknanda rivers are also in spate. Connectivity has been affected with the bridge connecting Rudraprayag and Gaurikund getting damaged. Five other hanging bridges were also washed away. Heavy rains over the past 36 hours swept away Tiloth bridge that joined Tiloth, Mandav and hundred other small villages to Dehradun. The earth movers that were working on the confluence of Assi Ganga and Bhagirathi river to clear the debris from 2010 floods were also washed away by the water. A hundred houses are reported to have been damaged in landslides and many were washed away at various places. According to Uttarakhand Police, three members of a family were killed in a house collapse in New Mithi Beri in Prem Nagar area of Dehradun on Sunday morning. The state government has announced a compensation of Rs 1.5 lakh to the relatives of those killed in this incident. Four people were killed near Bhim Gali at Rambara on Kedarnath route while one was hit by a boulder during landslide near Gaurikund. Five buses were also swept away in the relentless downpour which continues in the district; the six persons injured in these landslides have been taken to government hospitals. According to Devendra Patwal, disaster management officer, Uttarkashi, the Assi Ganga wreaked havoc and about 20 buildings have collapsed in Uttarkashi alone. The debris has created two blockages, worsening the situation. Landslides were reported from over 12 places on the Rishikesh-Gangotri, the Dehradun-Yamnotri, the Rishikesh-Badrinath and the Rishikesh-Kedarnath national highways. Helicopters have been deployed to evacuate stranded passengers. About 500 buses and private vehicles ferrying more than 10,000 tourists have been left stranded by incessant rains and accompanying landslides. More than 250 tourists are stranded on the Rishikesh-Badrinath and Rishikesh-Kedarnath national highway. According to Uttarkashi district magistrate R Kumar, 2,200 pilgrims en route to Gangotri and 1,500 pilgrims en route to Yamunotri were stranded after the roads were closed due to landslides at Pipalmandi, Baraki and Nalupani. They have now been evacuated to safer areas. The tours organised for pilgrims to visit the four centres—Gangotri,Yamunotri, Kedarnath and Badrinath—that began on June 13 has been suspended. Rest houses and hotels are brimming with people. All government schools in Dehradun have been closed and the state government is shifting pilgrims and tourists to schools and hospitals. D P Gujran, chief engineer, Ganga valley, says that water is being released from all the barrages and dams and a “free flow condition” is being maintained. The control room in-charge of the department says there is widespread panic among people and efforts are being made to pacify them. The Border Road Organisation (BRO) has been clearing roads that were blocked by landslides. The Indo Tibetian Border Police (ITBP) is also helping in rescue operations.